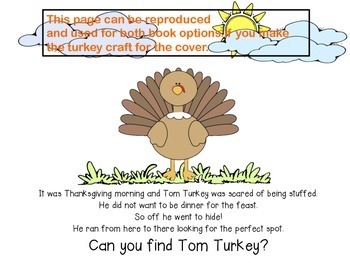 In November, use this darling Thanksgiving emergent reader to teach and reinforce sight words, punctuation, and positional prepositions. Use as a Print and Go or a 30 minute center activity. 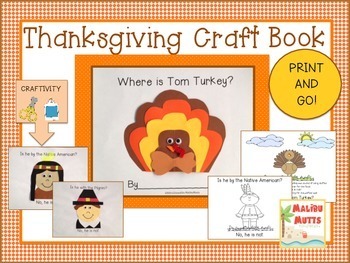 Included: color and black-line cover, 9 pages with text and black-line pictures, text without pictures, pattern templates for construction paper crafts for each page, photo samples of each craft, directions and template for Tom Turkey crafts. The book is designed to be used 2 different ways. Option 1 Print and Go! All of the words and images are printed on the pages and ready to use. 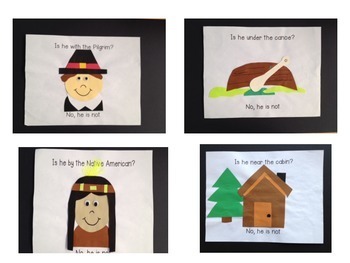 This can be used alone as an emergent reader and students can color the illustrations for the book. 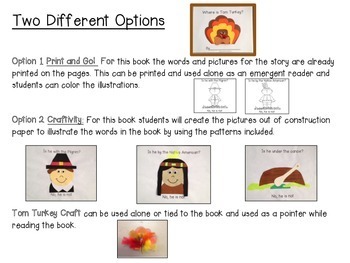 Option 2 Craftivity Using the blackline patterns included, students can create darling crafts out of construction paper to illustrate the words in the book.